Act #184: Break it down. 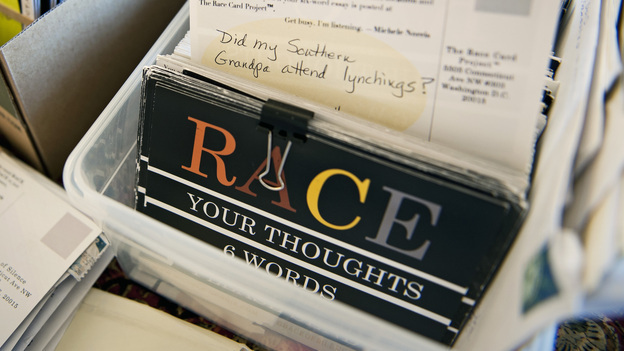 National Public Radio (NPR) recently partnered with The Race Card Project to explore a different kind of conversation about race. They asked people to think about their experiences, observations, triumphs, laments, theories or anthem about race or cultural identity......and then distill those thoughts and into one six-word sentence. Here are some of the powerful submissions. Black babies cost less to adopt. Mexican white girl doesn't speak Spanish. 55 mph means you, black man. I'm actively black. You're passively white. He's my dad, not my gardener. Care to share YOUR six-word race card? If so, please do so directly on this blog (rather than on Facebook), so that it is viewed by more people. Now, we're talking. That's the first step. Here's mine on a good day: In this house, we speak love. But sometimes when I read too much of the daily news: We can't save us from ourselves. Cannot understand the barriers of race. Arbitrary construct perpetuated by fearful hearts. White does not suffice, nor rainbow. Rocket Spanish: The Award Winning System That Will Get You Speaking Spanish & Loving Spanish Culture.